Minister of Power, Works and Housing Babatunde Fashola says the Federal Government is committed to finishing all ongoing projects within three years. Fashola gave the assurance on Saturday evening after inspecting work at the Loko-Oweto Bridge over River Benue which connects Loko and Oweto communities in Nasarawa State and Benue respectively. He said that the Federal Government would make funds available to pay contractors as soon as they delivered completed projects. “The Federal Government of Nigeria and President Muhammadu Buhari have expressed very clear commitment to finish the ongoing and abandoned projects. “We are focusing on completion of ongoing projects; this is one of the many ongoing projects. “Lagos-Ibadan expressway is one of them; Kano-Maiduguri is one of them; Ilorin-Jebba is one of them and the Second Niger Bridge is one of them. “All those projects now, the contractors are moving back to sites and work is beginning. Gradually over the next three years we would complete many of them’’, the minister said. Fashola expressed the confidence that the resumption of construction activities would stimulate expansion of infrastructure, create jobs and generate commercial opportunities for the people. 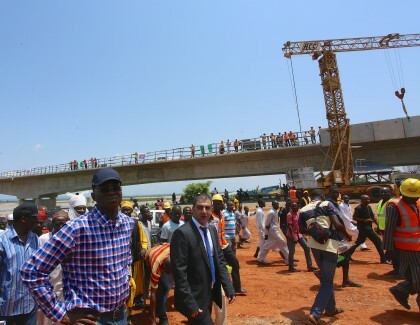 He said when completed, the Loko-Oweto Bridge would boost socio-economic activities in Nasarawa State and Benue. “You will see those who lost their jobs; they would come back to work. You would see increased merchandising and supply of building materials. “When this project is completed, it would open up these communities; connect Nasarawa State and Benue; farmers would benefit from the movement and transportation of their farm produce. “I am optimistic that we would get this project completed in 2018,’’ Fashola noted. News Agency of Nigeria (NAN) reports that the Loko-Oweto Bridge contract was awarded to RCC Nig. Ltd. in November 2011 at N36. 1 billion with original completion date of Nov. 15, 2015.